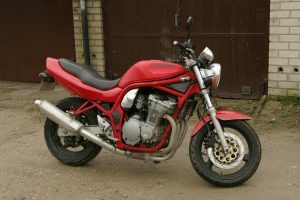 1995 saw the launch of the Suzuki Bandit – a bargain-basement bike, with top-level fun available with the flick of the wrist. The Suzuki Bandit sounded all mean, moody and as if it was going to stop you in your tracks and empty your wallet, but the reality was quite the opposite. Yes, it was parts-bin: the engine came from the old GSX600F ‘Teapot.’ Not the quickest, but the air-oil cooled motor was reliable (remember it can trace itself back to the GSX-R750F) and good for 70-80bhp and 125mph. 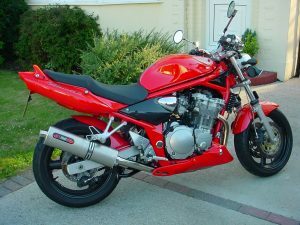 The plot was held together in a tubular steel frame, which had a whiff of the double-cradle about it from the GSX-R, but this was painted in the colour of the bike itself. 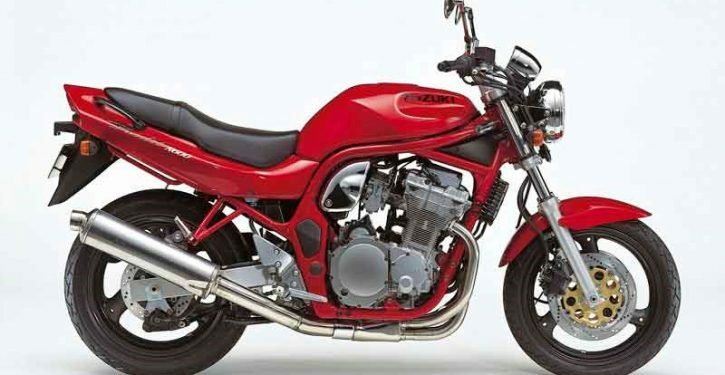 OK, so the suspension was pretty basic, being only adjustable at the rear for rebound and preload, but much fun could be had out on the road, more fun than on – say – the naked Yamaha XJ600N Diversion. Lots of fun; in fact: here was a bike where all these budget parts seemed to add up to more than the actual sum of the individual parts. Better still, it had a cool name ‘Bandit’. Thankfully, it didn’t look like a black Trans-Am, instead it was a smart-looking, naked ‘Universal Japanese Motorcycle.’ Remember, in the mid-1990s we seemed to love fairings but here was something stripped bare. Not ‘classically’ styled though, as this was a single, not a twin-shock machine. As the opposition grew and was ranged against it, the Bandit had to evolve at some point. The original model lasted from 1995-1999. We mentioned the original pricing: the £3999 price tag soon grew to £4499 in 1997/8 before dropping to £3798 in 1999 as the parallel import push saw the UK importers react. From 2000 in came a new and not so attractive model. The frame was different and so were the looks on the half-faired model, even if the motor was largely the same. The Bandit seemed to have lost its edge somewhat and gained 3mm more wheelbase too. This model came in new at £4649, so it was still keenly-priced. 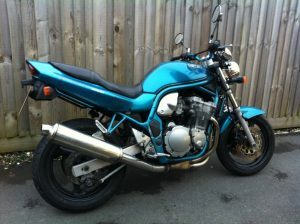 As was its successor: £4239 would get you the ‘new’ Suzuki GSF650 Bandit from 2005 with a bigger, updated motor and styling. Prices? Well, there’s one out there for every budget. Crappers start for a few hundred quid, while half-decent ones begin at a grand to £1500. We’ve seen very low milers go for around £2800… It is a classic… honest. FORKS: Soft as your nan when new, we suggest heavier oil and springs. Fork outers often suffer from pitting. FRONT BRAKES: Sliding twin-piston affairs that were never the best 24 years back. Like any they benefit from TLC to keep them working well, so regular stipping and cleaning will help. Braided lines, softer pads help with overall performance, too. FRAME: Paint also often flakes around the frame welds. CARBS: 32mm Mikunis on 1995-1999 bikes or 32mm Keihins on 2000-2004 bikes will always need cleaning if fuel has been left in them for any time. Carb icing can also be an issue. SHOCK: A budget item, even back in the day – these will not have aged well. EXHAUST: Originals can be hard to find as they never lasted. Weak points include the silencer, any weld area and the place where the end-can and downpipes meet. Any bolts used down there are likely to be seized too. Any holes will lead to a popping sound on a shut throttle. Engine: 599cc, air/oil-cooled, 4-stroke, inline, 16-valve four-cylinder. WHY WE LOVE IT: A bike greater than the sum of its (parts bin) parts!